Combining the look and feel of real wicker with the low maintenance of resin, this Grosfillex Java wicker chaise is the perfect way for customers at your hotel, poolside bar, or resort to kick back and relax! 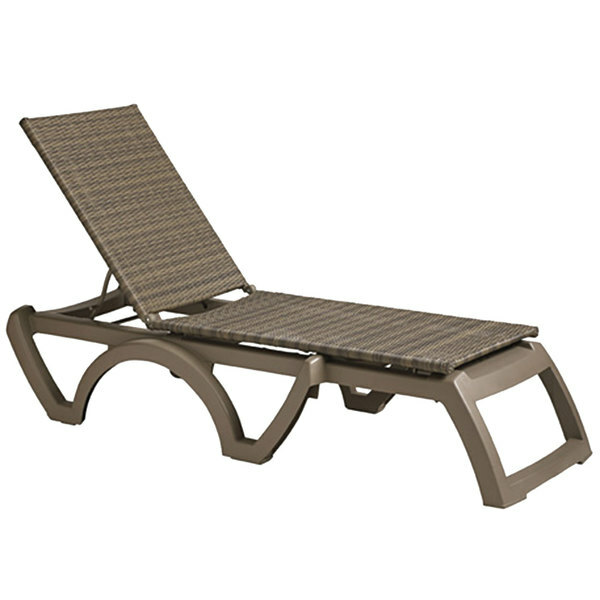 This chaise features a sleek taupe resin frame that easily adjusts for a quick poolside nap, relaxing with a drink, and anything in between. The moccacino-colored Viro fiber wicker weave resists cracking, peeling, and color fading without sacrificing comfort. The rugged construction can even be power washed for simple yet thorough cleaning, effectively maintaining its attractive appearance throughout extended use! The Java wicker chaise includes recessed wheels for ease of mobility and is stackable for convenient, space-efficient storage during off seasons.